I've never been to a festival. I'm a creature of habit, mashed-potato comfort, I like rugs. Our sofa's squishy. Maybe too squishy - it's hard to get up sometimes. I don't think it was a surprise that I ended up as an actor, and it was anything but a disappointment. I've always got my eye on my deathbed. I've got an overly developed sense of what selling out is, and I of course worry about it too much. There are still things technically about films that I think are a mystery to me and I want to remain a mystery. I don't particularly want to know what everyone's job is because I've got lines to learn. Acting is the only thing I'm even vaguely good at and acting is something that I think I do know about. I've got no anti-America or anti-Hollywood kick, it's just that I never wanted to go and kick my heels around L.A. for six months hoping something would happen. There is nothing far-fetched about disappointment as a subject for comedy. It's something we are all too familiar with. I've always loved Christmas and that's not really gone away from me from being a child to now. It's always a magical time and I'm unashamed in my love for Christmas. New Updates! (4/21/2019) We've been working really hard on completing our membership system so you can submit quotes and keep track of them. Once this is complete in the coming weeks there will be a lot more quotes by Martin Freeman and other authors. We've also changed the sorting on the site so you now see the latest Martin Freeman quotes first. 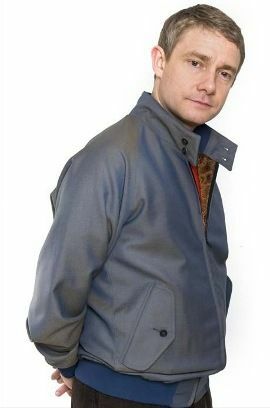 Our goal is to have the best Martin Freeman quotes on the web!